Patients go to clinics and hospitals hoping to get better. But sometimes they end up getting sick because they pick up infections passed on by doctors and nurses who haven't washed their hands. Hand-washing — or the lack of it — is a big issue. The Centers for Disease Control and Prevention says doctors, nurses and other hospital staff generally wash their hands far less than they should. But St. Paul-based Ecolab believes it has a system that can assure that caregivers' wash up virtually without fail. 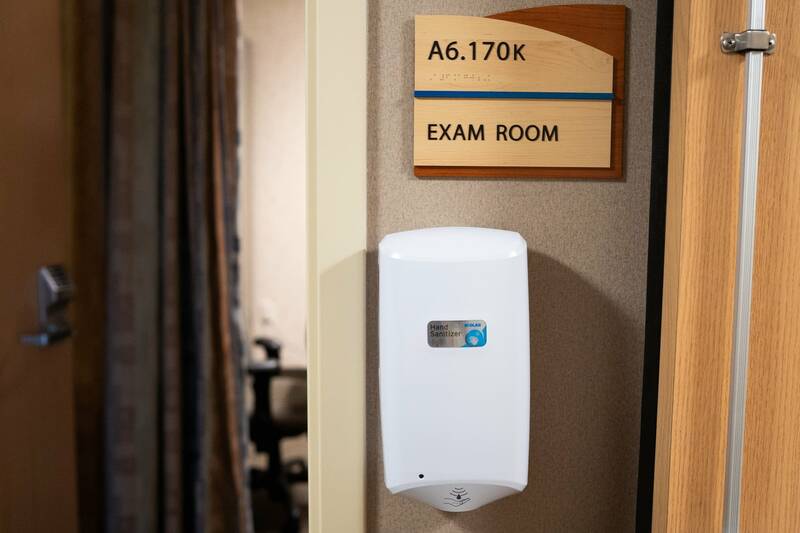 North Memorial Hospital in Robbinsdale has been testing an Ecolab hand sanitation monitoring system that tracks about 100 caregivers in an oncology ward to see if they sanitize their hands before treating patients. "We can know just how nurses are doing or how physicians are doing," said Stephanie Swanson, manager of infection prevention at North Memorial. "So, you really get an opportunity to understand where you could improve." Swanson and other hospital staff on the ward wear badges that are electronically linked to hand sanitizer dispensers and beacons in patients' rooms. The badges — which are about the size of credit card — reveal if a wearer's hands are clean or not. Badges stay green for five minutes after a hand-washing. But if Swanson were to treat one patient and then move to another patient without cleansing her hands, the badge issues a hard-to-ignore warning. "I'm going to get a little beep. And then my badge is going to turn red," she said. Overall, Swanson says staff have been washing their hands 95 percent of the time. She says doctors and nurses have embraced the system, seeing it as a welcome reminder and not an affront to their conscientiousness. Hand hygiene rates during the pilot have largely been in line with what was estimated through occasional observations. But the Ecolab system provides a much more timely and comprehensive picture of what's going on. The system, for instance, generates reports about individual performances. And Swanson said that some nurses have been perfect, even though they may have to sanitize their hands hundreds of times during a shift. Some reports have indicated that 1 in 20 patients pick up an infection somehow while in a hospital. But Swanson said the rate is probably much higher. Such infections drive up hospitalization costs, increase patient suffering and potentially reduce reimbursements that a hospital gets from the government. 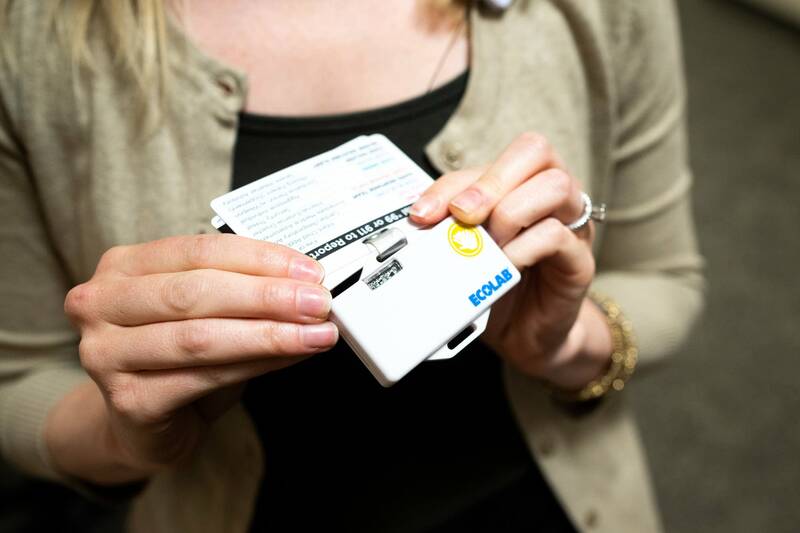 "Hand hygiene is the easiest way to prevent infections and so it's really a no-brainer that you focus on hand hygiene as a health care organization," she said. Ecolab is one of several vendors of systems that monitor medical staff hand-washing. According to the nonprofit ECRI Institute, which monitors medical equipment pricing, the annual cost for such systems ranges from $450 to $2,000 per patient room. Ecolab didn't think up the monitoring system. It was initially developed by a small Florida firm, UltraClenz, it acquired in late 2016. Ecolab thought it'd be a good fit for its hand sanitation products. "It's like the seatbelt reminder that you get in your car," said Kathleen Burzycki, a senior marketing manager for Ecolab. "You go in your car and you're in a hurry and you forget to buckle the seatbelt. And what does your car do? Your car beeps at you and it flashes a light. And then you say, 'Oh, I didn't mean to do that. I didn't mean to be unsafe.'" So far, the Ecolab system is deployed at eight Florida and Colorado hospitals. The company wants to take it nationwide. In addition to Minnesota, system trials are underway at hospitals in Ohio, New Mexico, Michigan, Virginia and West Virginia. And Burzycki sees a lot of other potential markets. "Areas like long-term care," she said. "Who knows? Maybe the future may be in restaurants." The CDC says hospital staff definitely need to do a better job washing up. "We know from careful studies when people really aggressively look, less than half the time they should be cleaning their hands are they doing so," said Dr. Cliff McDonald, associate director for science for the CDC's Division of Healthcare Quality Promotion. He says some medical staff have to wash their hands hundreds of times a day and sometimes they're just so busy that they forget. And that can lead to infections among patients. "We don't know how many are due just to the failure to clean hands," he said. "But certainly a significant proportion are." He thinks that systems that provide alerts, as Ecolab's does, are really promising. "They can actually change behavior in process," he said.